Are you struggling to develop an efficient system for your move? 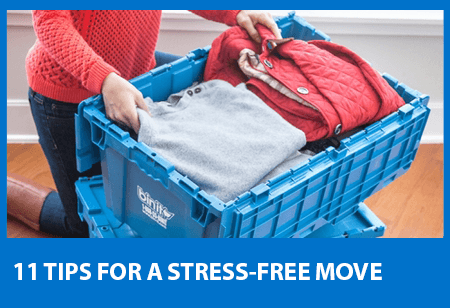 Check out these handy moving tips below to make your move effortless and easy. Adopt a “less is more” attitude when you move. Have a yard sale and scale back the things you don’t need. The less stuff you move, the less energy expended – better for you and the environment. Fill some sturdy handled shopping bags with bulky closet items such as shoes, sweaters, belts, and jeans. Fill the bottom of the wardrobe boxes with some of the shopping bags then add your hanging clothes. Pack hanging items tightly so things won’t move around and fall off the hangers. You’ll have fewer boxes, and closet items remain together. Also, the shopping bags will make it easier to retrieve your belongings from the bottoms of a tall wardrobe box. Don’t make them so heavy that they become a challenge to move. The more you can pack ahead the more time you will save on moving day. Do you really need all your pots and pans or winter clothes in the summertime? Live out of a suitcase and travel cosmetic case for the last week and pack up your shampoo and extra toothpaste. Make sure all your bins close properly so that the tops are flat. If you over-pack a bin, you risk damaging the contents. Stacking plates on top of one another is dangerous! Pack them vertically with our special plate packs to keep them from breaking. If you must clean your old place after moving out, put together a basic cleaning kit. Clean anything you can ahead of time (the inside of kitchen cupboards, the oven, windows, etc.) and pack any other cleaning supplies you don’t need. Fill your luggage and duffle bags with clothing, sheets, towels and paper goods. Try to keep valuable possessions, such as laptops, jewelry, important documents, etc. with you. It may be a good idea to keep tools you’ll need to reassemble furniture with you as well. Packing materials can increase your expense and clutter landfills. Consider an alternative to bubble wrap such as using old newspapers or purchasing recycled paper. We offer packer’s newsprint made of renewably sourced packing material which is biodegradable, recyclable, and compostable. Skip the hassle of calling for an estimate over-the-phone with Unpakt. Use their site to upload your move inventory and compare dozens of real-time quotes from top-rated movers. You can update your inventory up until the day you move! If you must move liquids, use either a sealable container or waterproof bags. On the first day you arrive (and every season you do a clothing swap) place all your clothes with the hangers backward so they are harder to remove from the clothing rod. At the end of the season you will be able to tell which clothes you didn’t wear all season and donate them – because the hangers will still be backward. You can stop junk mail by registering with the Mail Preference Service at the Direct Marketing Association. It won’t stop all the stuff you get daily in your mail, but it will help to reduce a large amount of unwanted paper. Set up a recycling center in your new kitchen where it’s easy and handy to separate paper from plastic recyclables. Making recycling easy ensures that you’ll be more likely to do it. Are You Prepared For Your Upcoming Move? It’s no secret that moving is stressful, from finding a new place to settling in and everything in between. The actual physical process of moving your stuff from one place to the other can be the biggest drag of all, and it’s definitely the least fun. When you Bin-It, you save hours of strain and frustration. We show up with stackable plastic bins, ready with labels for easy labeling. You pack them up, swiftly close the attached lids, load in your vehicle, and drive away. When you’ve finished unpacking, call or text us to come pick up the bins. You’re done! Make the smart move. Let Bin-It lighten your load. © Copyright 2017 Bin It. Almost there! 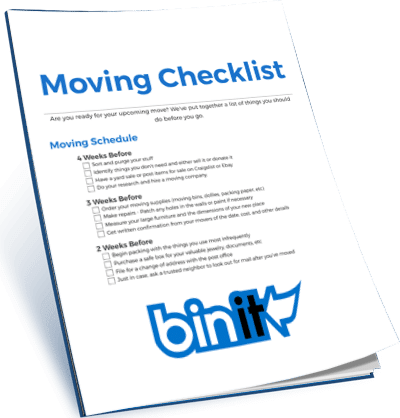 Simply provide your email to gain free access to our printable moving checklist.